Carly is still experiencing a lot of spirit activity (as described in my previous post), which she’s capturing in photos and video. 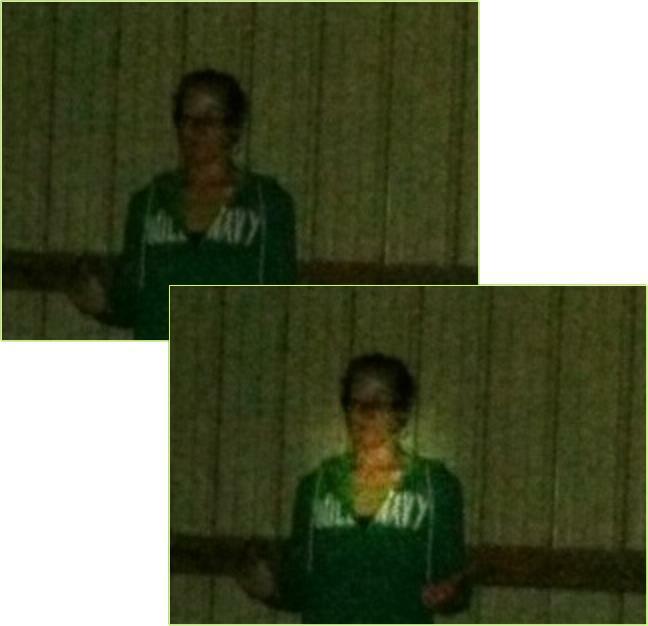 In the enhancement below you can see two or three spirit faces, reminiscent of the spirit-face photos I used to take with a Polaroid camera in the presence of the luminator. (Read more…) Carly was using a regular digital camera in this selfie. Our next step is to start building an ITC communication bridge… and you can help, if you’re interested. This article explains both how we plan to go about establishing the bridge, and how you can help. First, we’ll build it around the thin veil that Carly has going on in her life. Spirit activity has become a part of day-to-day living for her! So far it shows itself mostly as “paranormal activity”… noises, interesting photos, etc. She feels the presence of a portal on her property, similar to the one that visiting psychics saw in my lab… an invisible doorway through which spirits would come in to work with me and my equipment. We hope to nurture that activity at Carly’s place into a finer level of spiritual activity that involves ITC contacts. How? Second, I’ve been meditating with my ITC spirit friends, including the ethereal being Isar, who was introduced into my research while I was still working with my friends in INIT. My intent now is to start mobilizing a spirit group around us whose members are dedicated to ITC, to the safety of our earth-side efforts, and to the betterment of the world… so that anyone who participates comes under an umbrella of spiritual protection and cohesiveness. Carly and I talked on the phone one morning last week, and I had a sense during our phone call that some of those good folks moved in close to observe both of us. After the call, she too felt observed by the presence of unfamiliar energies. My team, I think, was getting a feel for the terrain that would be involved in setting things up for us. Some of the spirits that have been active around Carly will probably resonate with the project, and will join the spirit group. Others will probably move on… those who might be more disturbing or disrespectful or generally troubled. Shortly after the phone call I had a wonderful, light meditation, thinking about Isar and a friendly spirit group that might want to work with us. I had a dream that night in which I was in a room or lab or large den with a group of people. They all seemed nice, but serious, maybe even a little stodgy. So I was led to some kind of glass elevator and went down a floor, where another group of very contented and more easy-going people were lounging around and chatting. I felt a lot more comfortable there… although they were just a little leery of my presence. They seemed to regard me as a sort of loose cannon from Earth, driven a bit by hormones and ego. Not as settled into spirit-life as they were. Still, I felt resonant with that group… but I wasn’t there long before waking up. I’m pretty sure that I was visiting an ITC sending station in my dream. Timestream described those spirit-world stations to our INIT group through ITC contacts. They’re like buildings with several floors or stories. Each floor is a different level of spirit, but they’re all working together on the same ITC project(s). Some people there can move among the floors (spirit dimensions) in the course of their work. It’s called a “dispassing point” by our spirit friends. It’s a “location” in spirit where dimensions cross… and it manifests at the third level as a multi-story building. I think that by us crossing paths—Carly and me—the ITC spirits are assessing things between us and in our lives to see if and how things might unfold into an ITC project here on Earth. Third, Carly plans to start experimenting with a hand-held recorder, to see if the veil that’s opened up for her can support voice communication in addition to the many other spirit activities she’s experiencing. Fourth, we’ll try to sustain resonance in the project with a heart meditation… and that’s where you can help. It could benefit our project, and it could have great rewards for you. Here’ (below) is a link to the heart meditation, which I posted on-line today. By clicking the link, you’ll have a new tab open up in your browser. From there you can listen to the heart meditation. You’ll have the best results if listening through stereo headphones. Note: I make my last comment in the guided meditation about 8 minutes in, with the words, “… bask in the light.” And the meditation continues for another 5 minutes with nothing but background meditation sounds that can keep you in a meditative state. Doing the meditation won’t just help us; it’ll almost certainly uplift your day to a brighter vibration. It’s part of my Bridge to Paradise CD, which was engineered by The Monroe Institute. If you want to experience the complete meditation, including a guided tour through an afterlife paradise, you’ll have to listen to the CD. The link above just provides a short excerpt involving a heart meditation. This entry was posted in After we die, Heaven and Earth, Inner exploration, ITC, what then? and tagged heart meditation, ITC, ITC bridge. Bookmark the permalink. Hello Mark – I love the work you are doing and always feel very uplifted after a visit to your website. Just a small question please, will I be able to download the full Bridge to Paradise recording via my Spotify account? It’s a long time since I’ve listened to music/recordings any other way. Many thanks. Lisa. I haven’t used that, so I don’t know if it’ll work. Many thanks Mark, I’ll give it a go and provide feedback for anyone else who might be interested. Best, Lisa. All of these parts are so, so important…but in my very own opinion, #4 is the most important. Creating and sustaining resonance is the single most important part of an ITC bridge – it is the very support for a link between both sides of the veil. Mark has mentioned that our spirit friends have spoken about what the bridge looks like to them when there is resonance. They can see into our world and interact with us with crystal clarity if the resonance is strong – but if the opposite becomes true, they liken it to a fog that becomes thicker and thicker, and the bridge is tougher and tougher to sustain. It always brings me back to what Konstantin Raudive said in 1994 to Mark and his colleagues at Maggy’s home. Listened to the Heart Mediation last evening. It felt fine, and I will continue. I did not know about this recording before. You say “You’ll have the best results if listening through stereo headphones”. Is it recorded with HemiSync effects? Best wishes for our bridge building! I’m delighted that you’re going to participate. I suspect our spirit friends also will appreciate the familiar energy! Hello Mark, I read your posts about this, and did the meditation, and hope it is of some help with the work. I am very glad to be part of this. Can you clarify for me that last word you uttered just before (or maybe, as) the meditation ended? Thanks. I just fixed that meditation and posted a new version. And then the meditation continues for another 5 minutes without voice… just background meditation sounds. After reading your comment, I noticed that I didn’t “call you back” at the end of the meditation. So, I removed that last sentence from the meditation (around 8 minutes in), and so now, “… bask in the light” is my last comment, and the meditation continues for another five minutes with the background meditation sound. I changed the link in my post (above) to point to the new, corrected meditation. I thought I heard you say ‘welcome’ – one word just as the background sound ended – so I continued to sit for a while before I realised that that was it. I enjoyed that meditation, and will certainly do it again. I hope all’s well after the hiatus.